Polyhedron Collider shows off the new game from Double-Edged Games and gives us their thoughts on King Down. 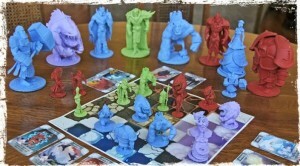 King Down is the prequel to Chess, well in the narrative sense at least (Chaturanga is the real prequel) but that’s not a very good description of what this Kickstarter game is all about. A better way to explain it would be that King Down is a card driven battle game that takes a lot of its ideas from Chess but mixes them up in interesting ways.